This week's Herb of the Week is one you might be familiar with – Ginseng. Long used in teas, it is known for providing us with plenty of energy as well as antioxidants. Read on to learn a bit more about Ginseng, and why I decided to use it in my products! 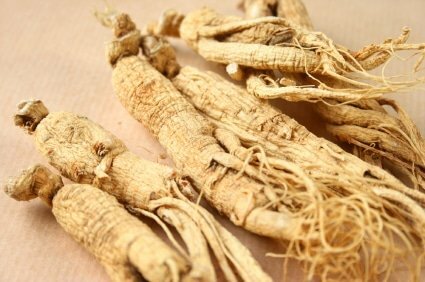 Ginseng has been used for hundreds of years around the world. One of the most popular medicinal herbs, it is known for its ability to give people an energizing feeling without the edginess often associated with caffeine. Included in a variety of teas, the Chinese have long seen the benefits of ginseng in their lives. Some of the more popular traditional uses of it include benefits for reproductive health and Type II Diabetes. Known for being rejuvenating, ginseng is able to provide assistance with environmental stressors and the appearance of aging skin. Clearly, I'm a big fan of the positive effects that ginseng can provide for our skin. Because of this, I've included it in my Anti-Aging Eye Cream, Herbal Facial Oil for Normal and Combination Skin, Anti-Aging Facial Oil, and Coconut Body and Face Oil. Not only will adding a little Ginseng in your diet help you (perhaps via a cup of tea, or a serving of bitter greens), I know that my organic skin care products can help make your skin look and feel its very best, naturally!